In the past week, Earth has shaken with more than 50 earthquakes and nearly 20 volcanic eruptions. 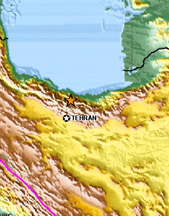 In Iran, a magnitude-6.3 earthquake caused extensive damage and loss of life on May 28. And in Hawaii, lava from Kilauea picked up intensity and reached the sea on the night of May 30 for the first time in a year. Nature's forces are at work all around us. One of the world's most active volcanoes, Kilauea on the Big Island of Hawaii, has recently picked up its activity. 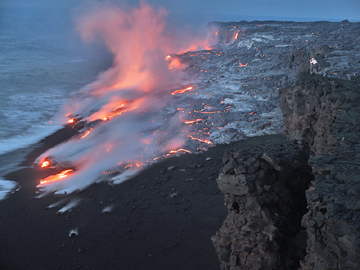 Fresh, hot lava has reached the ocean for the first time in a year (at right). Photo courtesy of USGS Hawaii Volcano Observatory. A strong earthquake struck the Mazandaran-Qazvin provinces about 70 kilometers north of Tehran at 5:08 p.m. local time on May 28, according to the U.S. Geological Survey. The quake killed at least 35 people and injured more than 400 as it ripped through the mountainous region near the Caspian Sea. A magnitude-6.3 earthquake struck a Caspian Sea province of Iran on May 28, killing 35 people and injuring hundreds (at left). Image courtesy of USGS NEIC. The initial magnitude-6.3 quake and its more than 100 aftershocks rocked the foundations of much of the infrastructure of northern Iran, damaging nearly 3,900 buildings, according to the Tehran Times. Many of the casualties from the quake actually stemmed from major landslides and rockfalls along the mountain road linking Tehran to the Caspian Sea city of Chalus. Giant boulders crashed down from the mountains and covered the road, crushing cars and people as they tumbled. Additionally, nine people (including a provincial governor) who had been surveying the damage died in a helicopter crash in the mountains. Some of the world's most active fault lines run under Iran, so earthquakes are not uncommon. Last December, more than 25,000 people died in a devastating magnitude-6.6 quake in Bam, in southeastern Iran. Kilauea Volcano on the big island of Hawaii is one of the most active on Earth, beginning its current eruption in 1983 and picking up its pace over recent months. In a beautiful display, hot lava cascaded into the Pacific Ocean on May 30, marking the first time in a year that lava reached the ocean. "This current flow started slowly," says Donald Swanson with the U.S. Geological Survey. The "banana flow," as it is called (because it flows through a stand of banana trees) exited a lava tube high on the volcano several months ago. In May, the lava began flowing downhill toward the sea. Scientists are out daily to monitor and study Kilauea's eruption. Tourists are coming in droves as well to witness the only place on Earth where hot lava is cascading in fingerlike prongs into the ocean and creating new coastline. Photo courtesy of USGS Hawaii Volcano Observatory. At the oceanfront, the fingerlike flow is about 500 meters wide. Roughly 200,000 to 300,000 cubic meters per day cascade into the ocean, Swanson says. Kilauea's usual daily output is around 350,000 cubic meters, "which is the equivalent of 40,000 full dump-truck loads per day," Swanson says. The volcano is producing new coastline as lava enters the water. Since lava first hit the ocean in 1986, the volcano has created 540 acres of new coastline, says Mardie Lane at Hawaii Volcanoes National Park. "Kilauea is getting bigger, the park is growing." 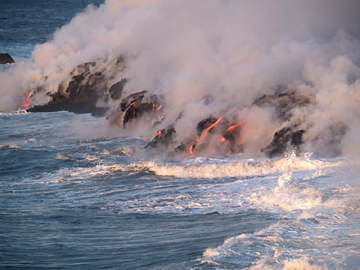 However, the waves constantly battle with the fresh lava, undercutting it and washing away the newly generated land, creating hazardous land and surf. Also, the combination of the surf and the lava creates and sprays a mist of hydrochloric acid and fine particles of volcanic glass onto onlookers standing downwind. The air is very hot near the lava and reeks of acid, which can exacerbate asthma or other respitory problems. "It is beautiful, but you don't want to be there for long," Swanson says. 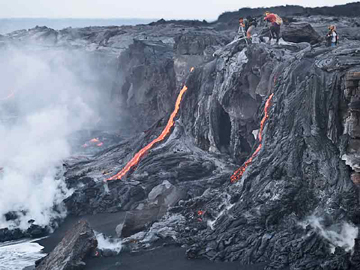 Since lava from Kilauea first reached the ocean in 1986, it has created more than 2 square kilometers of new land. It is a constant battle, however, between land and sea. As soon as the lava reaches the ocean and begins to cool, the waves tear at it and wash much of it away. Photo courtesy of USGS Hawaii Volcano Observatory. Despite the hazards, more than 1,500 people are visiting the erupting volcano daily, Lane says, up from 400 a few weeks ago. "This is the chance to see one of the greatest shows on Earth," she says. Kilauea is the only place on Earth where visitors can both see lava flowing into the ocean and get anywhere close to live lava flows. Visitors can hike three-quarters of a mile out to see the lava in action. The park provides rangers to answer questions and a video and handouts on lava safety. "Our biggest concern is for safety," Lane says. Scientists do not know why Kilauea suddenly began flowing to the shore, but geologically speaking, it's nothing new, Swanson says. But with no idea how long the lava flow will continue, Swanson and colleagues are at the volcano every morning, studying its behavior. "It could continue for months, or it could quit tomorrow  we just don't know," he says.